Beetlejuice is an American comedy-fantasy horror movie that premiered in 1988. Tim Burton was the director of the film, and Warner Bros Pictures was the distributor. The story centers on the couple Barbara and Adam Maitland who died in a car crash and became ghosts. They wanted to get rid of the new occupants of their home but failed to do so. So they asked the help of Betelgeuse (pronounced and occasionally spelled as Beetlejuice). Betelgeuse or Beetlejuice is a former assistant of Juno, the afterlife caseworker of the Maitland couple. The character decided to quit as an assistant and become a Freelance Bio-Exorcist and claims he can get rid of the living humans out of ghosts’ homes. The Maitland couple hired him because they are having a hard time getting rid of the Deetz family, who currently lives in their mansion. Beetlejuice is the main character of the series and also the main antagonist. 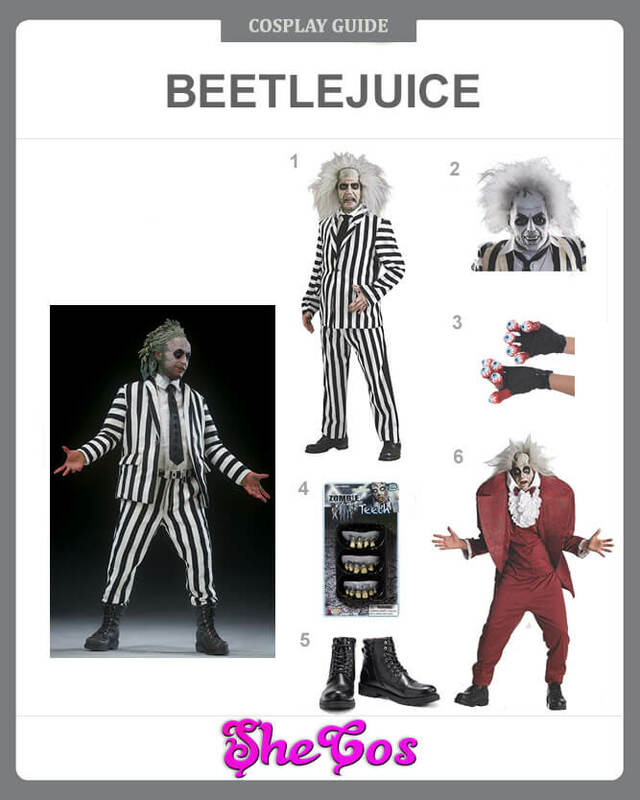 This article will be a Beetlejuice costume guide. Beetlejuice is one of the main characters of the series, and he is also the main antagonist. Adam and Barbara Maitland summoned him to help them get rid of the Deetz living in their house. His method of scaring the Deetz, though, requires harming them physically, which didn’t sit well with the Maitlands. Being the main character and the main antagonist of the movie, Beetlejuice is a favorite option for people to dress up in for Halloween or costume parties. The Beetlejuice costume set for this character includes two full costumes. One is his usual white with black vertical stripe suit that he is seen mostly wearing throughout the movie. The outfit consists of a Betelgeuse latex mask with white hair, black high-cut shoes, zombie teeth, and black gloves with eyeballs. The other suit is his red tuxedo with white polo underneath that he wore during the marriage ceremony. Beetlejuice is a very rude ghost, who is also a pervert. He is also a bit of a disgusting individual who constantly spits on his coat and makes rude gestures. Beetlejuice is selfish and only cares about his well-being. Especially, when he was forcing Lydia Deetz to marry him to allow him to escape the Netherworld and wreak further havoc in the living world. Despite his lousy personality and the character being the movie’s main villain, Beetlejuice is still a favorite option for people to cosplay in during costume parties or for Halloween. 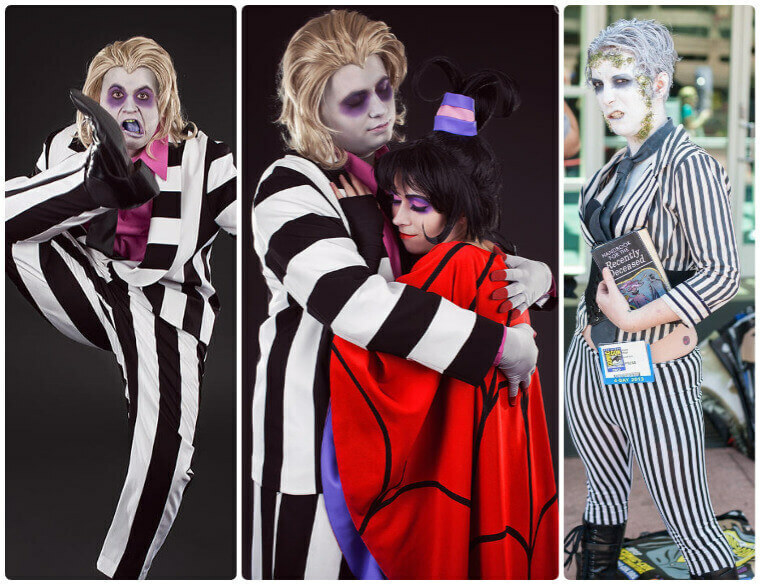 Looking at the Beetlejuice cosplay photos, you can see that the character is not only a favorite of men but women as well. Dressing up as Betelgeuse will look good, regardless of your gender. The character’s appearance makes for a crazy and scary look, which is perfect for any costume party with a horror theme. It’s also a great idea to cosplay in Beetlejuice and Lydia costume with your friend as a couple.